This beautifully renovated, second floor, one bedroom Kiawah Island vacation rental, located at 4257 Mariners Watch Villa, has a screened porch and is a 60 second walk to the beach. Upon entering the foyer, you are welcomed by a tranquil color palette and hardwood floors. You can go left into the bedroom or straight to the main living space. The bedroom features a king bed, wall-mounted flat-screen TV, and private entry to the hall bathroom. 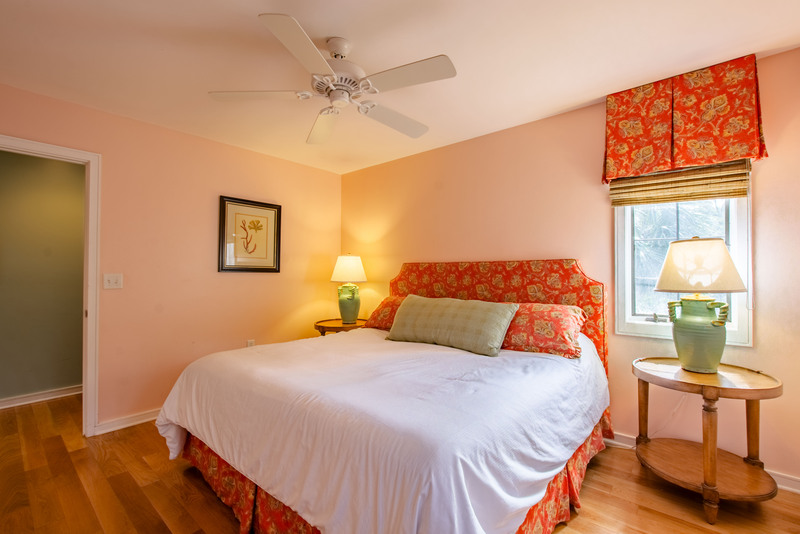 The bathroom is conveniently accessible from the bedroom or hallway and offers a large tiled shower. Down the hallway is the open living space with kitchen, dining and living areas. The comfortable living room offers a sofa, cozy side chair, wall-mounted flat-screen TV, DVD and Blu-ray players, and screened porch access. The fully equipped kitchen showcases stainless steel appliances, granite countertops, and white cabinetry and allows for easy meal preparation and entertaining. The dining area features a table with seating for four. The main living space is highlighted by soaring ceilings, a wall of windows and sliding glass door access to the screened porch. The screened porch, also with an elevated ceiling, provides four chairs and abundant opportunities for relaxing and viewing the surrounding natural beauty and nearby lagoon. A bike path is conveniently located behind the villa, and the beach boardwalk is about a minute’s walk from the villa’s front door. My wife and I spent our honeymoon at this location and loved it. The area is really nice and we were in walking distance to the beach. He condo we had was so quaint with all the amenities we could want. It was especially convenient having the beach chairs, umbrellas and beach mats provided. Staff was prompt in replying and courteous. Loved our stay with Akers Ellis at Kiawah. We had a great experience renting this villa. We were surprised there was no beach equipment so we decided to pay it forward and bought beach chairs and an umbrella for the villa. This definitely made our beach experience a whole lot better. If you have a bad back you probably won't find the bed mattress comfortable. Otherwise it was all good and I recommend this rental unit. Hi David, We do not supply beach chairs but if a kind renter, like yourself, leaves beach items in the villa we will leave them for other guests to use. We also have beach rental companies we can recommend. Thank you for letting us know about the mattress. We will discuss it with the owner. Please let us know when you are ready to book your next vacation to Kiawah. We would love to host your stay again! UPDATE: We are happy to report that as of 2/6/2018, the villa has a brand new mattress! We had a great time in the condo. It's an ideal location close to the beach, the park, and the Sanctuary. It's updated nicely and has all the amenities you need for a beach vacation. We were pleased to find out they had a couple of beach chairs and an umbrella available even though we brought our own. We had a great stay and loved our location. We ate every meal outside and enjoyed watching the wildlife. The bike trails were wonderful and the beach was incredible. The unit was in a good location for beach access. The kitchen was in excellent shape except the oven was extremely dirty inside. Bath was small but clean. Floors looked fairly new and were clean. The mattress needs to be replaced before the summer season if you don't want to receive lots of complaints and we could not lock the slider. We are sorry to hear you were dissatisfied with your villa. We want our guests to be happy with their stay. We wish you would've contacted us regarding the housekeeping issues. We would've been happy to address the issue immediately. Please contact us when you are ready to book your next Kiawah stay so that we can help you find the perfect villa and give you the best price available. We look forward to hosting your next stay! Dana Jiles, Rental Manager UPDATE: We are happy to report that as of 2/6/2018, the villa has a brand new mattress! Perfect spacious villa that was so convenient for a great beach week. Clean, well equiped and we absolutely loved the island. Great location. Easy access to beach for long walks. We were so happy and satisfied with our rental experience – definitely a 5! The villa was beautiful – I loved its décor, and it looked just like the pictures online. Also, your iPhone and iPad app were so easy to use and being able to check in and out via mobile was the best. This was our first time to Kiawah and we were impressed how visitor friendly the island was. We look forward to returning next year – thanks again for the wonderful experience! This condo was a great place to spend a vacation! Very clean (only a little mold in the shower), looks exactly like the pictures, close to the beach (we walked 3 miles each morning), had everything we needed in the kitchen for breakfast and fixing snacks. Management was very nice and helpful, check in and checkout couldn't be easier. We went to Bohicket Marina to Lokal and Reds for several meals, has beautiful sunsets on the water. LA Tela in nearby Fresh view had wonderful pizza, and liked the market there. Would highly recommend this property!! Absolutely wonderful stay looking forward to next visit. It was a 5. Everything was great. I appreciated the effort to clean it quickly so we could get in earlier. Your team did a perfect job! They were very professional and efficient each time I contacted them. I rented the unit for my brother who was visiting from New Hampshire and they had wonderful time. We will use you again. We had a great time, definitely a 5 out of 5. It is an amazing island. My wife is already planning a return visit. We loved the area, the beach was beautiful and the villa was perfect, not to mention the dining and the locals. Everyone we encountered were very friendly and informative, except for the gator that stole my fish. We can't wait for our next visit, we will absolutely be in touch. We are keeping your app on our phones as a reminder. Thanks again for the hospitality. We would give you a 5 and definitely recommend your rentals to anyone coming to Kiawah Island. I would rate the experience a 5. The entire experience from start to finish was great and very easy the way you have it all set up. I would definitely rent from Akers Ellis again. We had a great time and would give a 5 rating. We had some issues with ants that were promptly treated when we found them, but they came back on our last night. Other than that, all good. We were delighted with our experience with your vacation rental company. The condo was very comfortable and your staff was responsive to our requests. We have visited Kiawah many times and this was definitely our best experience! The space was charming and comfortable but a bit worn and could have been a bit cleaner. Though not quite on the beach, the short walk was very easy even while carrying our beach gear. The landscaping was lush and beautiful. I do not have the words to describe our joy on that lovely beach. Akers Elis made it simple to rent for the weekend. Everything was a 5!! Thanks! Our stay in Kiawah Island was outstanding and we would definitely rate it a 5! The condo was perfect for us. We are hoping to return to the island next year with our family and we will be looking for a bigger condo or house to rent. We will certainly look to rent from your company again. Thanks very much. Our overall experience was a 4 due to a few minor irritants. But overall we had a good time. I very much enjoyed my vacation at Kiawah. I will certainly return and plan to use your company to book my next stay. We truly enjoyed our all too short stay at Mariners Watch Villa. The condo was perfect, and I loved the screened in porch. The beach was wonderful, and the accommodations were perfect. It was a wonderful vacation, everything went really smoothly and was extremely easy. From booking it to checking out, I really appreciate the organization and attention to detail. The villa itself was also AMAZING! I definitely plan to use Akers Ellis for any of my future trips to Kiawah. Thanks for a great trip!